Cherub launch into their opening song. That was the introduction Cherub guitarist and vocalist Jordan Kelley gave for their song Heartbreaker. As the crowd at the 9:30 Club in D.C. found out this past weekend, a lot of f***cking awesome things also happen when you combine Kelley and the other half of Cherub, Jason Huber, with 1,200 concert goers on a Saturday night. At 9:00 PM the doors, plastered with signs reading “Sold Out,” opened to the queue of excited twenty-something year olds waiting outside. The growing crowd spent the next hour grooving to an opening set from Gibbz, a Brooklyn based singer and producer signed to Gramatik’s Lowtemp label. Gibbz smoothly transitioned from triggering samples to singing to playing guitar over top of FM bass lines and disco-reminiscent rhythm sections. Ghost Beach lead singer Josh Ocean hits a high note. Following Gibbz’s performance, two figures resembling the Yeti and Big Foot on a summer holiday emerged from the darkness and approached the microphones and synthesizers set up on stage. As soon as the music started and the lights came on it became apparent that this was no cryptid family reunion. Instead, this sighting was of Ghost Beach lead singer Josh Ocean wearing a thrift-shopesque white coat over a black Nirvana t-shirt and guitar, synth, and MPC player Eric “Doc” Mendelsohn (and his frizzy hair) dressed in a floral button down shirt. The only monsters that appeared on this night came in the form of funky bass lines and an inflatable crocodile that Ocean surfed on through the crowd. The audience soaked up Ocean’s soaring vocals and danced along with Mendelsohn’s triggered slap-bass and ’80’s influenced guitar riffs. 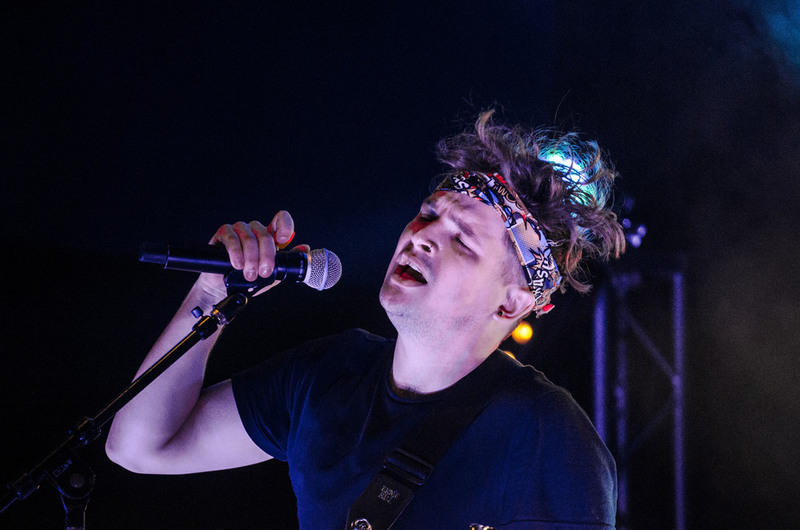 By the end of their set, nearly every square foot of the 9:30 club was packed with smiling fans eagerly awaiting the first notes of Cherub’s opening song. The chants of “Cher-ub, Cher-ub” grew so loud that somewhere an angel turned its head, wondering who was calling for it, and transformed into a roar when Kelley and Huber took the stage. Dozens of arms reached out towards Kelley as he ran in front of the crowd before picking up his guitar. 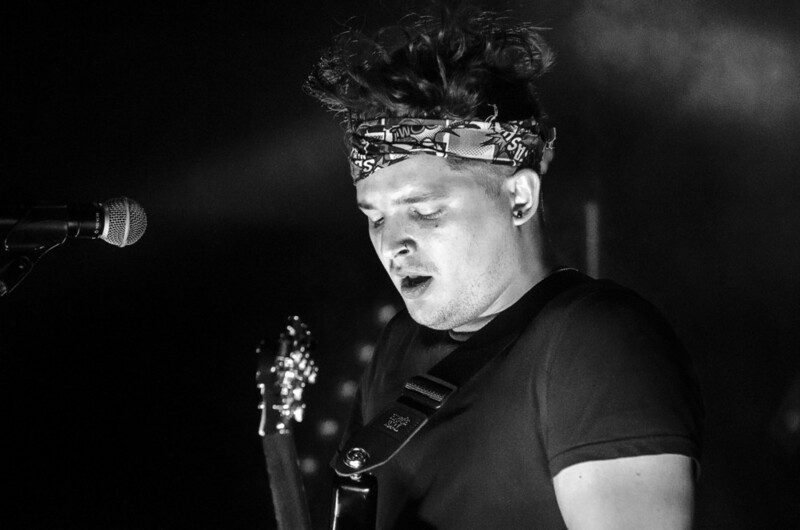 From the first note of the set to the last chorus of their hit song “Doses and Mimosas,” Cherub rocked, serenaded, and seduced the 9:30 Club audience. Mid-way through their set, Kelley and Huber paused to ask “whose first Cherub show is it tonight?” The response to their question was only topped in volume when they followed up by asking who had seen them before. Cherub guitarist and lead singerJordan Kelley interacts with the crowd. Cherub’s unique mix of soulful vocals and synth driven melodies combined with lyrics about champagne for breakfast and the energetic stage personas of the Nashville based duo brought the energy of the night to a high that lasted throughout their set. The Champagne Showers tour is slated for several more dates in the North East before wrapping up on the West Coast.